It is Monday and you should be nice and relaxed from the week-end. You should be fit for a fight and ready to take on another week. My daughter is taking her final exam today in Norwegian and I am sure she will slay it. She is a fighter and has worked hard to finish High School. That is something that can not be taken for granted here in Norway. 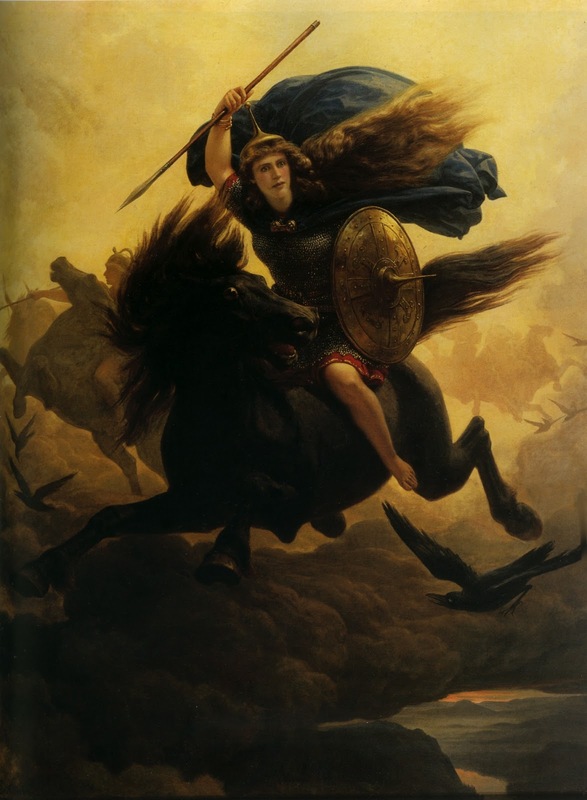 So today I am thinking about women who fight hard to get what they want and since it is story day, my choice falls on the mighty Valkyrie. In Norse mythology the choosers of the slain are called Valkyries. They are a team of Warrior maidens on horseback led by feisty Freya and her cat drawn chariot. If you are a handsome warrior strutting your stuff on the battlefield, watch out for 40 raving beauties on flying horses descending upon the pitch. The Valkyries shriek, howl and cause total confusion. Why? Because they can grab any warrior they fancy, and take him away. There is only one rule; the bewildered champion must be dead first. So you must fight for your life, because if you fail you could be scooped up by one of these mighty and deadly beautiful Valkyrie's and then swooped off to Valhalla which is the Heroes Heaven.There you will be forced to feast,drink gallons of mead, and fornicate all night. Sounds horrible doesn't it? If there is a heaven, what do you think it would be like? Do you ever feel like a Valkyrie? I often feel that way once my husband gets me angry enough. i can not even imagine how wonderful heaven will be! Yes, sounds terrible. Kill me now! I think Heaven will be beautiful beyond our comprehension. There seems to be a Norse myth to cover every occasion! I use the Choosers of the Slain in my urban fantasy set in New Orleans of all places! I have always been fascinated with Valkyries. Did you ever see the stretching of the Valkyrie and Odin and Grendel myths on XENA? Odin rumbled from Asgard over that one! Siv, I had Gurd, not Freya, as leader of the Valkyries in my novel because in my mythos, Freya had been killed as a precursor to Ragnarok ... that tidbit seemed awkward to the story so it got edited out. Besides I didn't want to irritate Freya by misrepresenting her!! Never irritate a Valkyrie! !